HZ Electric Supply is proud to announce that it will now be partnering with Rola-Case to give electrical contractors the vehicle storage items they need to fully organize their work shop on wheels. Rola-Case was originally developed in Australia and is now a leading supplier of van and truck storage solutions. Just like HZ Electric, they provide consistent quality products, friendly service and have a strong reputation for giving electrical contractors exactly what they need to get their work done each day. Electrical contractors in the Massachusetts, Connecticut and Vermont areas will enjoy our wide selection of Rola-Case products. But if you don’t see what you want, just let us know and we’ll order it. As a full service electrical distributor, that’s the HZ commitment. We value your business and strive to have the right products at the right prices. And now that includes Rola-Case vehicle racking and storage solutions. Whether you’re just starting out as an electrician or have been doing this for years, you may already be aware of the importance of being organized. There are just so many small parts that you must carry around each day including fuses, wires, connectors, plugs, switches, boxes and so much more. There’s nothing more frustrating that having to search through the truck looking for a specific junction box or switch. But when you have a place for everything and everything is in its place, you can go right to the part you need and get on with your workday. Rola-Case has been around since 1982 and originated in Australia. They have built an amazing reputation by designing and building tough products that can withstand the harshest usage. Their products are engineered to the highest standards and that’s another reason why we know that our customers will love Rola-Case truck and van storage. Now you can get next generation vehicle shelving & modular mobile storage systems at reasonable prices at HZ Electric. 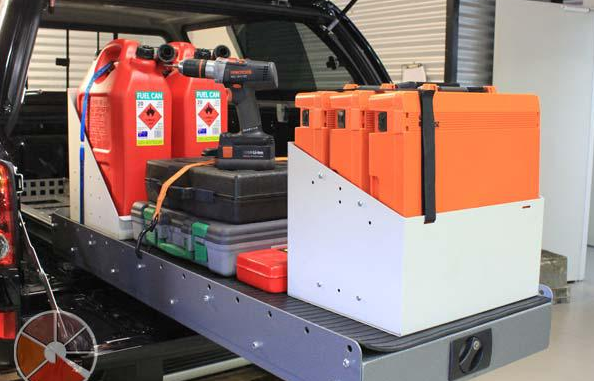 Whether it’s van racking, van shelving, rubber matting, and vehicle accessories to mobile systems for trade professionals, Rola-Case is designed, tested and manufactured to meet all your workplace needs. Unused floor space in your work van is an excellent place to find some ingenious new ways to turn that space into useful storage. Electrical contractors carry around so much gear every day, such as test meters, electrical tape, wire connectors, ballasts and more. By optimizing all the available space in your cargo van, you can save time and find the exact part you need in moments, instead of searching for twenty minutes. Rola-Case is helping trade professionals optimize their cargo van so they can get more done in less time. Next time you visit an HZ Electric, please be sure to check out our supply of Rola-Case truck shelving and van storage solutions. Whether you need van racking trade kits or metal and plastic cabinets, we’ll help you outfit your vehicle to work smarter, not harder.